Tis the season for holiday parties of all kinds. But if we’re being honest, our office party can sometimes be the most awkward party of the year. Well, I made it my mission recently to think of the best ways to change office parties from the most awkward, to the most fun. 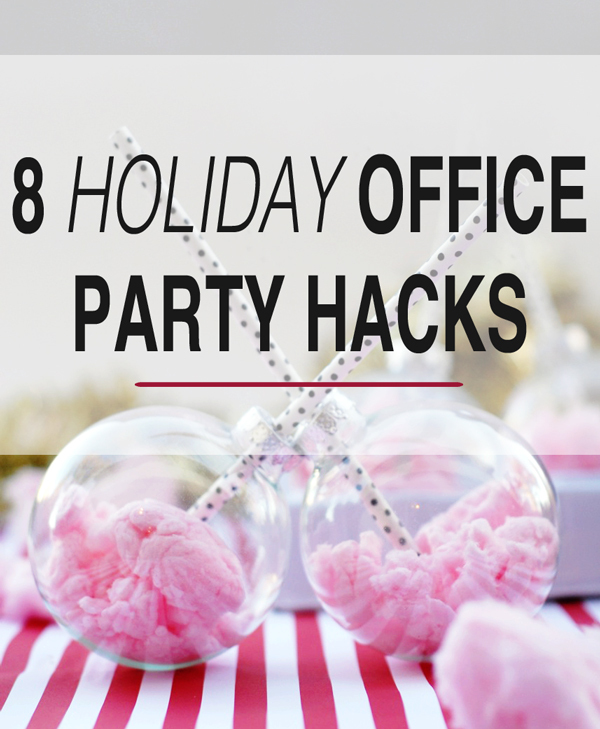 Here are 8 simple and great ways to up the ante and make sure your office holiday party is the best this year – no lampshade wearing necessary! 1. 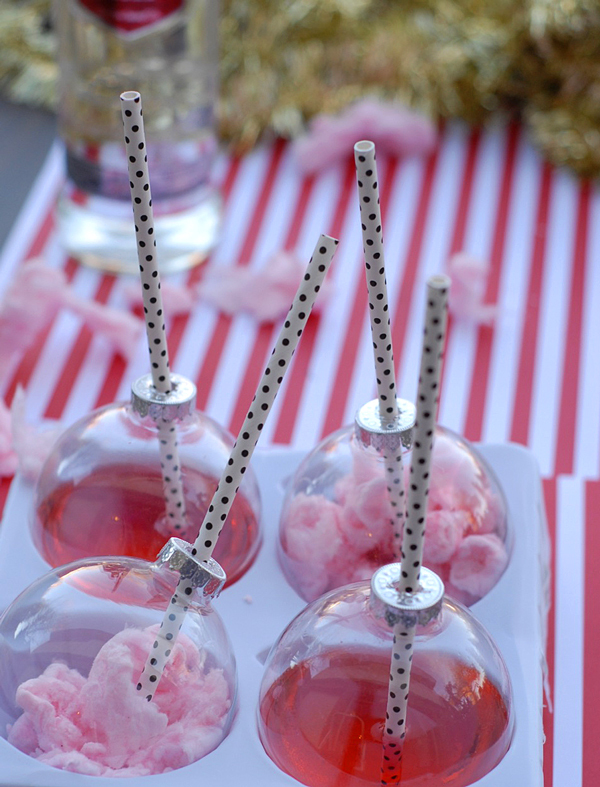 A fun way to make the ornament exchange just a little sweeter this year – use the ornaments as party cups! These ornaments were purchased at our local craft store (choose from glass or plastic) and the top hanger was replaced with a festive straw. 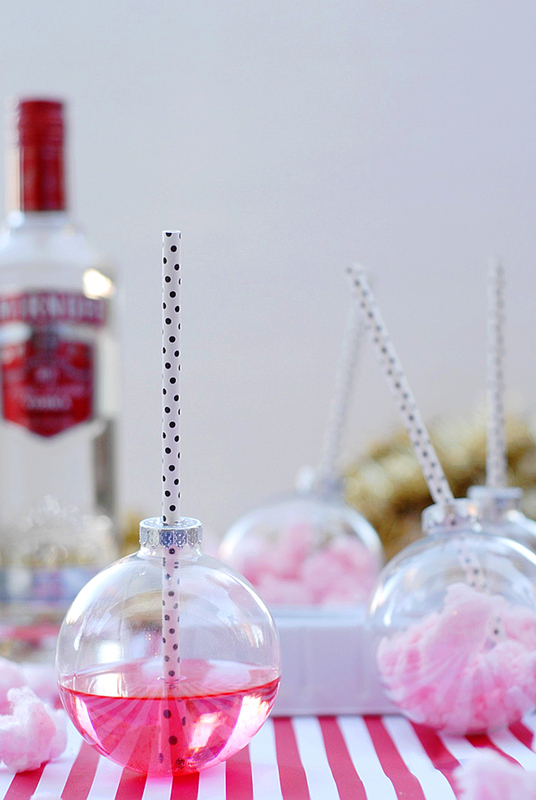 I love the look of them filled with cotton candy, and when a shot of Smirnoff No.21 is added – they instantly turn into a candied sweet sipper that will add a dose of festive whimsy to the holiday party. 2. Dasher and Dancer and Prancer and Vixion can certainly do more then wait while Santa empties his sleigh – they can keep the drinks chilled all night long. 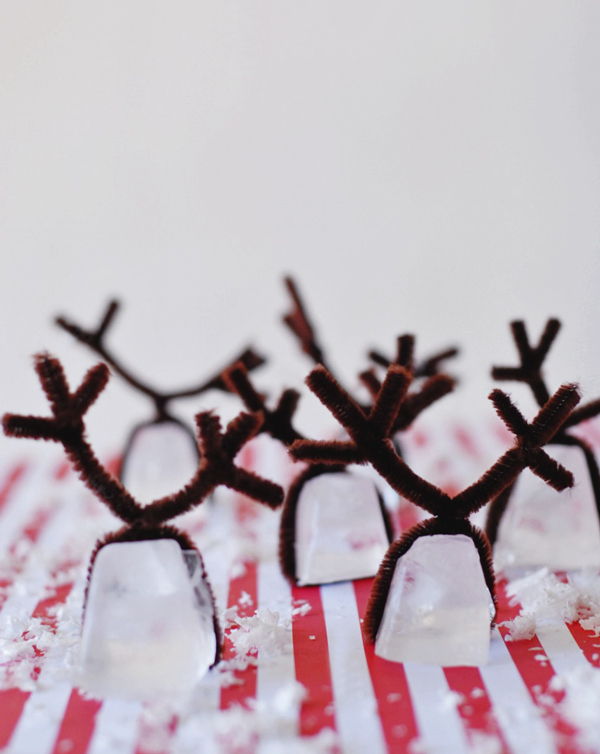 Make these reindeer ice cubes with one brown pipe cleaner bent into shape. 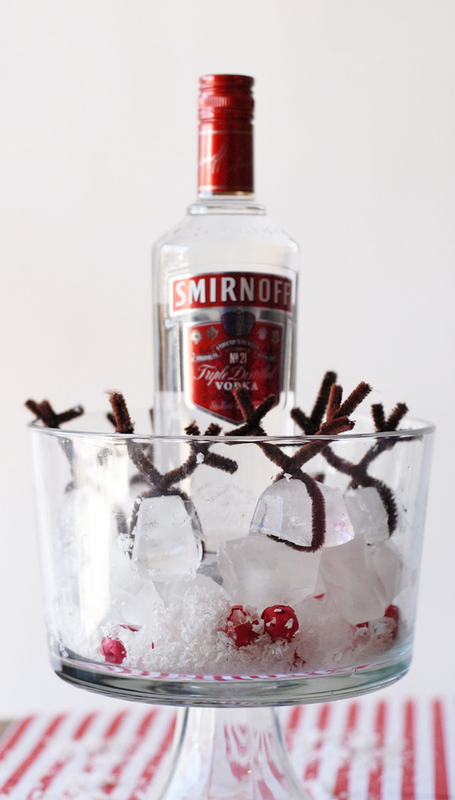 They look great in a clear ice bowl along with snow and red balls reminiscent of Rudolph. 3. For the coffee table, keep your co-workers healthy and in the spirit with their own orange snowmen. 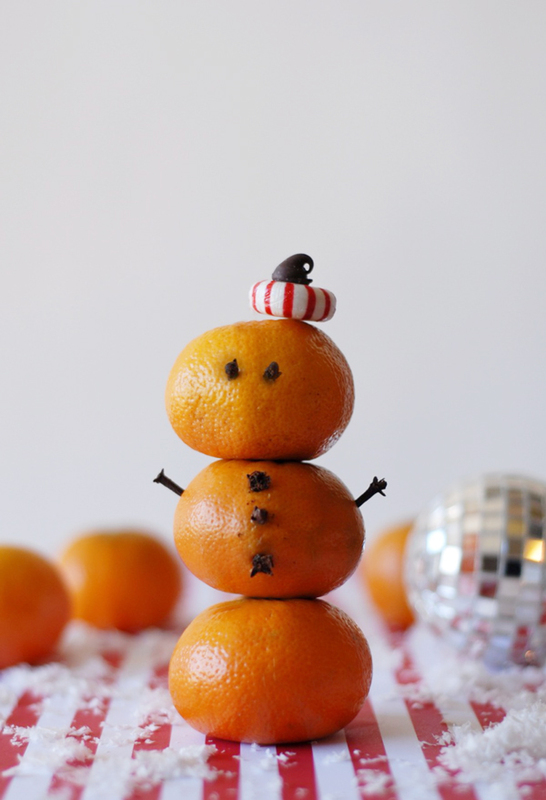 Stack three oranges together with a toothpick, add cloves for the eyes, hands, and buttons, and a peppermint hat (with a chocolate chip) to top him off. 4. Raid the recycle bin for an easy winter table-scape. 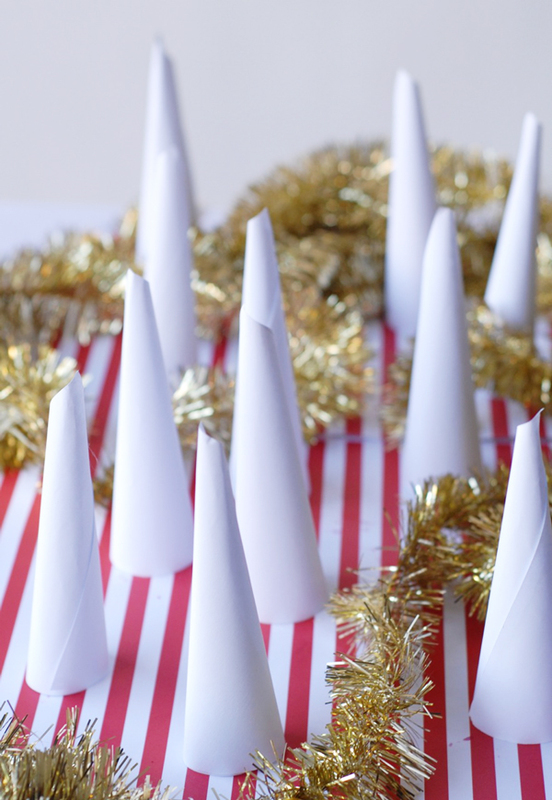 Turn extra paper into a forest of white by turning each paper inside-out and rolling into a cone shape, finishing off with a small length of tape. Sprinkle snow or tinsel around to finish off this easy look that could fill an entire conference table in a lunch break. 5. 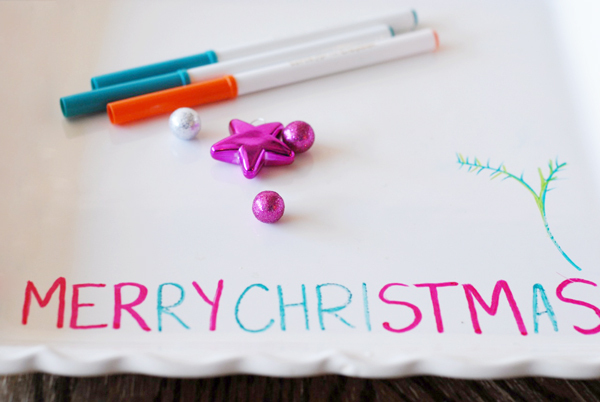 Don’t worry about getting special dishes for the party – just use the offices dry erase markers (or any washable marker) to write on the porcelain dishes you already own. The markers look right in place next to the whiteboard and they wash off after the food is served just as easily. 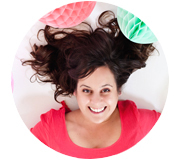 This is a party hack I’ve been using for years now – making one set of white dishes festive for occasions all year long. Note: the markers are not food safe so keep the edibles at a safe distance. 6. Don’t get confused figuring out who’s drink is who’s. Make a batch of cranberry monograms before the party, one for each employee. 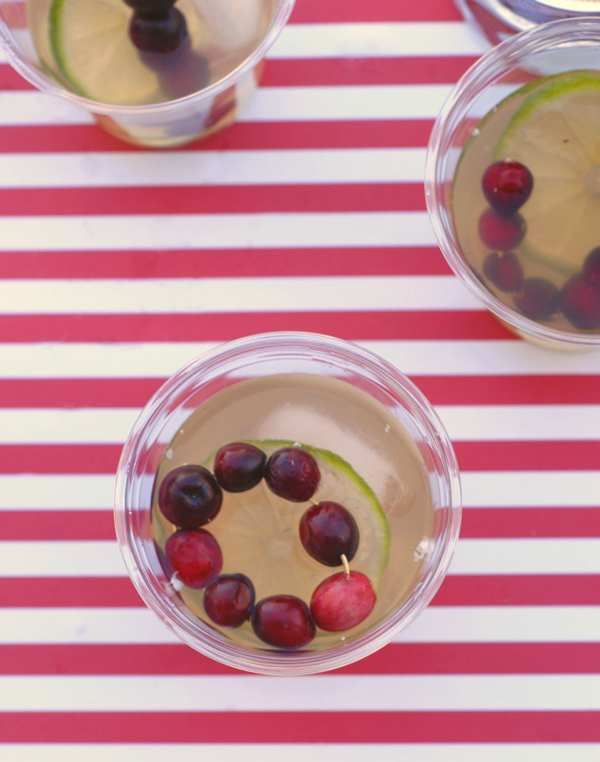 Float the monograms in drink cups for an easy reminder and a pretty garnish. They look exceptionally great with one of my favorite holiday drinks, the Moscow Mule. 7. 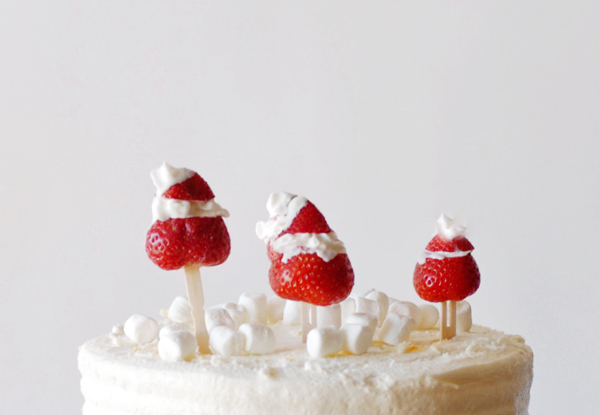 Making Santas out of strawberries and whipped cream has become quite the trend this holiday season. Make a batch by cutting the strawberry bottoms off and filling the inside + a dollop on top with whip cream. 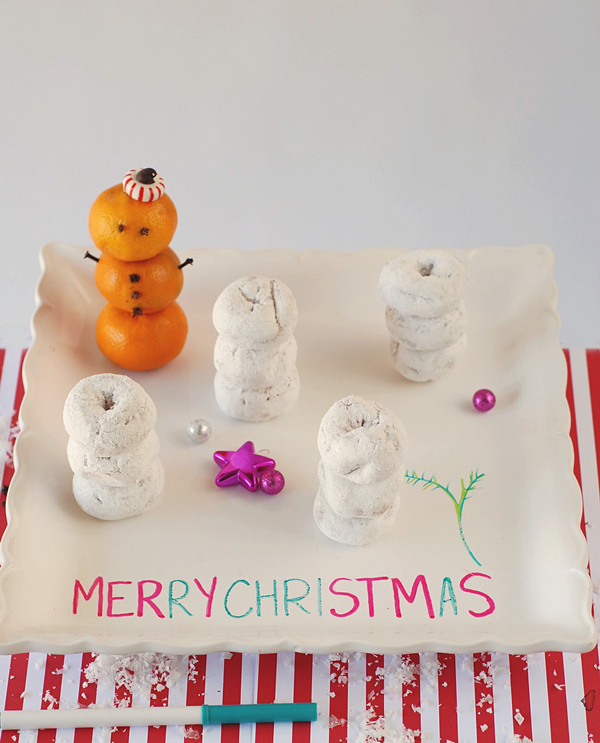 Line up the Santas on toothpicks to top the office cake, for a simple way to make the moment festive and fun. 8. 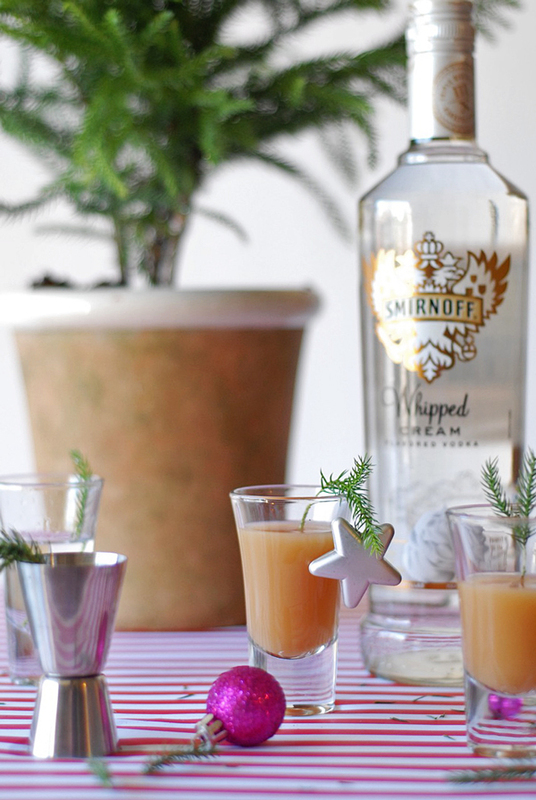 Finally, tiny tree drink stirs are a fabulously easy way to welcome in the holidays at an office party. Did you know that pine needles are edible? Not something I’d want to chow down on, but it does mean they are a perfectly safe way to mix a drink (like this yummy Java Jingle). 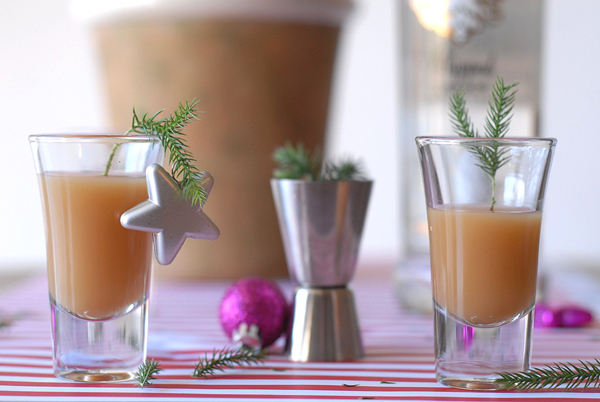 Simply cut off a small section of any pine tree, remove some of the bottom needles, and place in your drinks. Top with ornaments or leave natural for a very merry party this year. What great ideas and so creative. I’m going to try some of these! Those reindeer ice cubes would be cute with a cherry or a cranberry frozen in one end of a few of them – not every ice cube can be Rudolph! Wow, so many inspiring ideas! Can’t wait to try some of these! Thank you! Those ornament cocktails are super cute! Great for other themes, too! I’ve seen them at the big craft stores but they’re not marked food safe (or not). Did you get food safe ones? And if so, where?